Buy one pair of glasses and get the 2nd pair of glasses for $50 off. Call (214) 361-2313 today for more information! Tomato Glasses - Fits all children including special needs kids. Non-slip, Safe, Adjustable! Frames for Babies, Children & Teens. We know that you only choose the best for your children. At Dallas Youth Optical, we have made it our mission to treat your children like members of our own family. We know that you don’t trust just anyone with your children. That’s why we have made it our mission to create an eyewear store that is child friendly. Let our expert staff take care of your kids like they were our own. We know that children can be anxious when it comes to eyeglasses. Kids worry that they will be teased and made fun of. Preteens worry that they won’t look “cool.” We understand this and we have designed our shop with these things in mind. Our store is brightly colored, our staff is friendly, and we offer the latest eyewear styles. Your child is sure to find something to love in our amazing collection. Bring your child’s prescription to us and we will help your young one find frames that are both suitable and stylish. 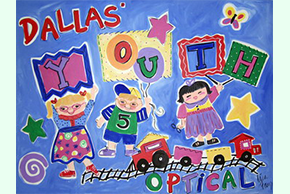 If your child needs eyeglasses, we invite you to stop by Dallas Youth Optical in Dallas, TX today! Our friendly staff members will help you and your child pick out frames that make your little one look like a rock star! Each member of our caring staff is looking forward to providing you with high-quality service. Stop by and see us today!